Our first collector badge from New York! East Syracuse PD has authorized The Lawman Badge Company to do a limited edition of 300 badges for their department. 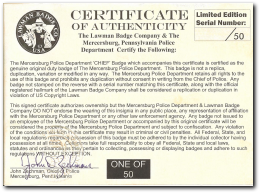 As always, these badges are authentic, highest quality, hallmarked, serial numbered and ORIGINAL DEPARTMENT EQUIPMENT with a certificate of authenticity hand signed by the Chief of Police authorizing you to possess this badge for your collection. A beautiful piece of law enforcement equipment, sure to be very popular with all police badge collectors. We went all out on this badge and commissioned famous train artist Steve Anderson to design the famed Empire Express #999 for our die maker and it came out spectacular. Train enthusiasts are going to go crazy for this one. As always, the badge has a solid back, all solid metal (no plating), standard safety catch, melted glass (cloisonne)letters and backfill and the super high quality you would expect from Lawman Badge. Badge is two tone measuring 3.5" x 2.5" and HEAVY. Custom die train is antique bronze finish in 3D high relief. We love this badge and know you will too. We are still the ONLY badge company that offers you original department equipment badges with the paperwork to prove it. Don't settle for less.